I just finished up a combat patrol and thought I would share the list I used. We played by the Adepticon 2013 rules found here, with exception of no flyers. This was meant to be more of a fluffy list with mostly scout type units. Half of this list can infiltrate, and another unit can scout if needs be. Essential this let's me deploy half of my forces last even if I get first turn.Also there is enough strength 8 in this list I feel comfortable taking out any armor I might see while marker-light assisted Kroot snipers should help me deal with infantry. Seeker missiles are incredible versatile when used with markerlights. They negate power armor saves, kill AV12 easily, and take away jink saves. I wish I had brought more. 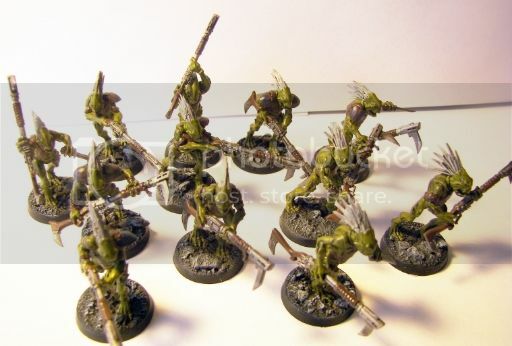 Kroot snipers boosted to BS5 are amazing at killing MCs and high toughness targets like Nurgle bikers. BS2 overwatch sounds fun but never proved useful. Supporting fire can be a nasty trick at these low point levels when only 2-3 models are assaulting you. Sorry this is such a short report but games were going so fast I wasn't taking proper notes. I'm looking to play in a 1550 point tourney in a few weeks and I"ll post up my list soon and try to document my experience with it. looking over the list.. isnt that 445 points? ?.